You’re probably used to getting turn-by-turn directions to your next destination with Google Maps, but there’s also a pretty-well-hidden Driving Mode just for... well, driving. It alerts you to traffic problems, directs you to nearby gas pumps and stores, and is useful for those times when you already know your route or don’t even have a destination in mind. 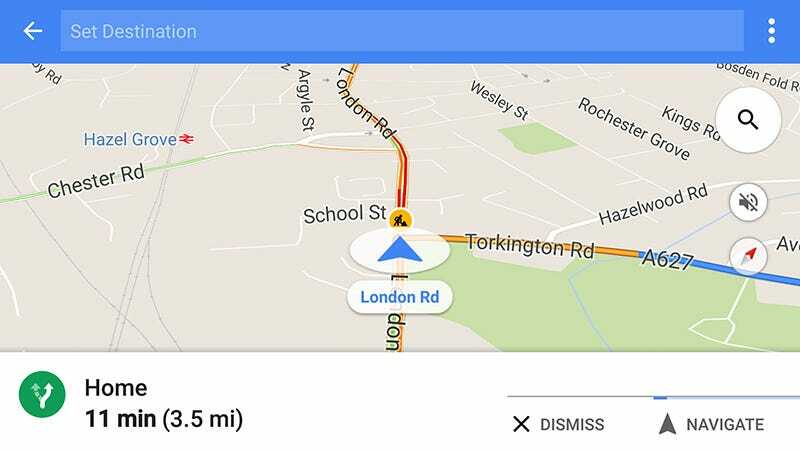 Google launched Driving Mode earlier this year for Android but it’s kind of tricky to find: in Google Maps, choose Start driving from the app menu or make use of the 1x1 widget (under Maps). Your screen fills up with your current position and nearby traffic conditions. If it’s close to commute time, you’ll see ETAs to your home or work (if you’ve added them to Maps). Driving Mode also shows ETAs to places you’ve recently been to or searched for. If you like the timings, you can hit a place to navigate to it in the normal way. For example, say you just got out of work and want to quickly know whether it’s worth heading home or going to the gym first. Driving Mode tells you with some driving time estimates and you can make your choice; as you motor around, the ETAs update. As in the “standard” navigation mode, you can search for nearby gas stations, restaurants, supermarkets, and more through the search button. Again, these results stay on screen until you dismiss them, so if you’re circling around looking for a place to eat then the results keep updating as you move. For those times when you know where you’re going but still want traffic updates, Driving Mode is helpful; it’s also useful when you’re touring around an area without any particular destination in mind. No word yet if the feature will make its way over to iOS.